In order to fulfill the intent of the Clery Act to ensure the safety of The University of New Mexico campus, UNM advises the campus community to alert authorities if you see the following individual on campus. Daniel Arushanov, age 24, is described as 5-10, 155 pounds with brown hair and brown eyes. 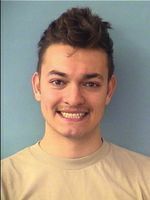 He was arrested last week on charges of unlawful carrying of a weapon on campus and violating a protection order, but was released from the Metropolitan Detention Center Monday night, Nov. 14. Arushanov is currently banned from campus. Because of the totality and seriousness of the outstanding charges against him and the violation of University policy, please contact UNMPD immediately at (505) 277-2241 if you spot him on UNM property.